World Champion Mark Selby scored a 5-3 win over Mark Joyce at the Baic Motor China Open, but admitted fearing a recurrence of an old neck injury. 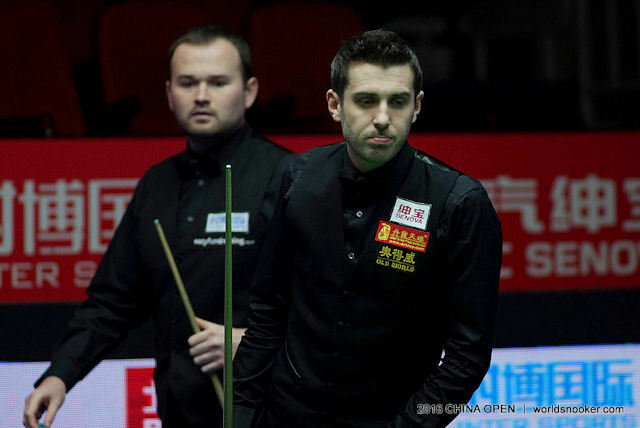 Three years ago, Selby suffered from a bulging disc at the top of his spine which forced him to pull out of the China Open and led to a first round defeat at the World Championship. Selby soon made a full recovery and went on to win the world title last year, and hopes he will be fit for the defence of his Crucible crown, starting on April 18th. The world number one led 3-0 today after breaks of 65, 87 and 58 before Joyce won three of the next four frames. Selby finally completed a 5-3 win with a run of 90. Judd Trump, who won the World Grand Prix earlier this month, was pushed hard by Andrew Higginson but eventually came through 5-3. Breaks of 100, 58 and 101 helped Trump build a 3-1 lead before his opponent fought back to 3-3. Trump then took the last two frames with runs of 60 and 67. John Higgins beat China’s Yu Delu 5-3 with breaks of 114 and 72 in the last two frames. In-form Mark Williams beat China’s Zhao Xintong 5-2 with a top break of 71, while Shaun Murphy top scored with 68 in a 5-1 win over Jamie Cope. Players Championship winner Joe Perry suffered a 5-3 defeat against David Gilbert, losing the last three frames. Indian Open champion Michael White edged out Ken Doherty 5-4 with a break of 74 in the decider, to keep alive his hopes of a top 16 seeding for the Betfred World Championship.